The First Church of Christ, Scientist has been a landmark building in Midtown, Atlanta since July 1914. Located at the intersection of Peachtree Street and 15th Street, it's very close to the High Museum of Art and Colony Square. First Church has a claim to fame related to Atlanta's major at the time of its establishment. 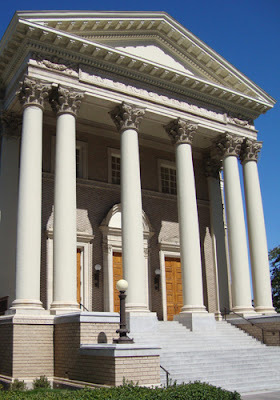 The wife of Mayor Livingston Mims hosted meetings at their home at the corner of Peachtree Street and Ponce de Leon Avenue, where the Georgian Terrace Hotel stands today. Not coincidentally, the two street-level restaurants at the Georgian Terrace are named Livingston and Mims. The Church also features a Moller organ. You may know Moller from references to Mighty Mo, the Moller organ in the Fox Theatre across the street from the Georgian Terrace. It's a stunning landmark standing proud on a little peninsula. I haven't been inside. What's it like?